One of the most recognizable and well-liked figures of the La Harpe School District has left to enter a new phase of life. Mrs. Pat Deitrich retired last week, working hard until her time with the district concluded last week. Helping to celebrate her amazing contributions to the school and honor the terrific job, friends, family, and co-workers gathered together at the La Harpe Club House for a retirement party a few days prior to her final day in the Central Office. Mrs. Deitrich was a graduate of the Class of 1959 at La Harpe High School, a class noteworthy in the fact that they were the first to graduate from the new high school. She then moved on to Western Illinois University in Macomb for a year, but came back to become the District Secretary. In 1961, Pat married Dwayne Deitrich and later on in the early 60s started a family together. As children came along in the early 60s, Mrs. Deitrich left her job at the school to become a stay-at-home mother. After all of her children had grown up, she began working again in 1986 at Housewright's Ace Hardware store in La Harpe. 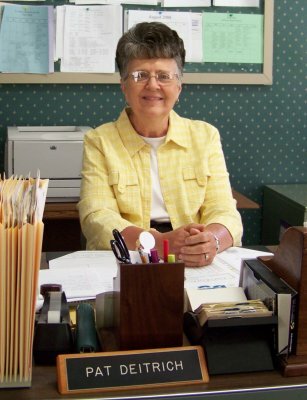 She came back to the La Harpe School District as part-time help in the Central Office under then Superintendent Ronald Blakely when Jean Cratsenburg retired in 1988 and became full-time when Dr. Steven Breckon came along in the early 90s. During her second stint with the La Harpe School District, Mrs. Deitrich extended her prior role to include being the Transportation Director for four years, along with being School Board Secretary. As School Board Secretary, Deitrich said she attended around 240 regular school board meetings, not including special school board meetings that were also held. In reflecting upon her time with the La Harpe School District, Mrs. Deitrich said, "I really enjoyed working with all the great people that have been here over the years. It has been a great place to work." A recent retiree of the La Harpe School District seconded those same notions, as well as added fond words about working with Mrs. Deitrich. Former La Harpe Junior High Secretary, Joan Siegworth said, "If there was ever a problem with anything at the Superintendent's Office, people knew they could go to her and get things straightened out. Everyone enjoyed being around her." Although Mrs. Deitrich will miss the daily contact with those she's worked with, she says, "I'm looking forward to being home and doing things I've been putting off. I can't wait to spend more time with my grandchildren and gardening." She also said, "It'll be nice not having everything on a schedule." Dwayne and Pat have four children (Cindy, Greg, Kevin, and Jamie), who in turn delivered ten grandchildren total. Jeanne Clayton will be taking over the vacant position in the Central Office, and Mrs. Deitrich remarked, "She will do a great job."